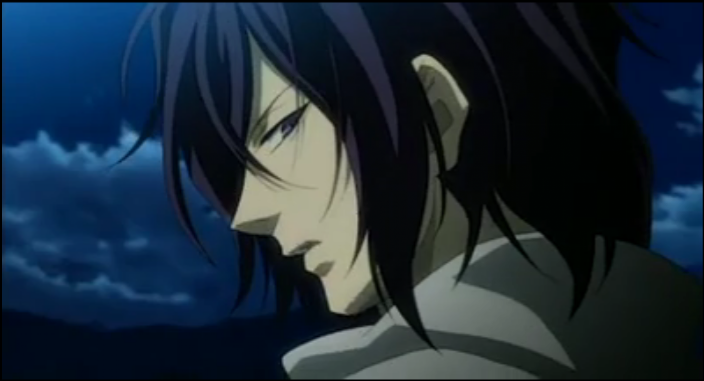 Episode 10 of Hakuouki tells the story of the incident at Aburano Koji. Chizuru attempts to convince Heisuke Toudou to return to the Shinsengumi. Also Souji Okita is visited by an oni. 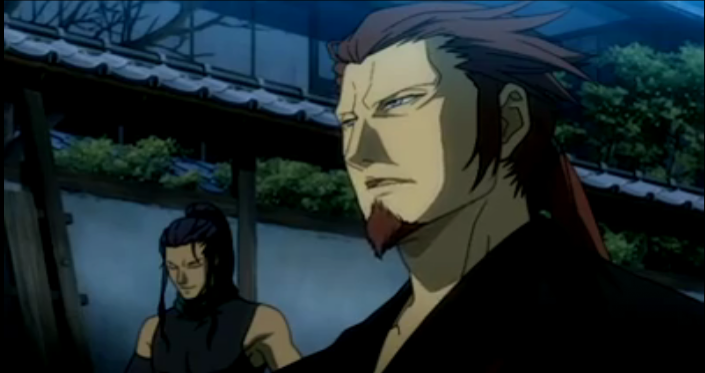 It was good to see Saitou-san back with the Shinsengumi. 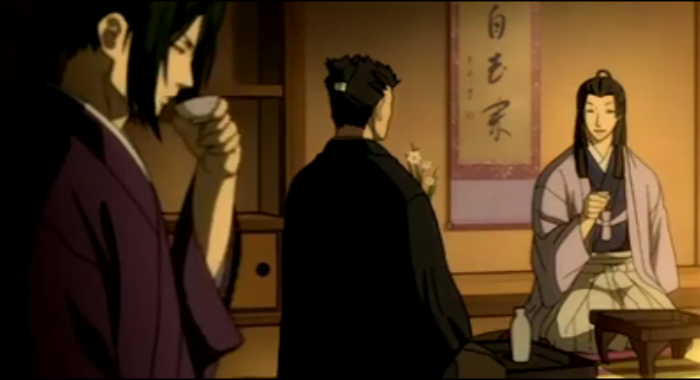 Saitou only joined Itou to spy on him and his men. He returns with word that Itou is plotting to assassinate Kondou. 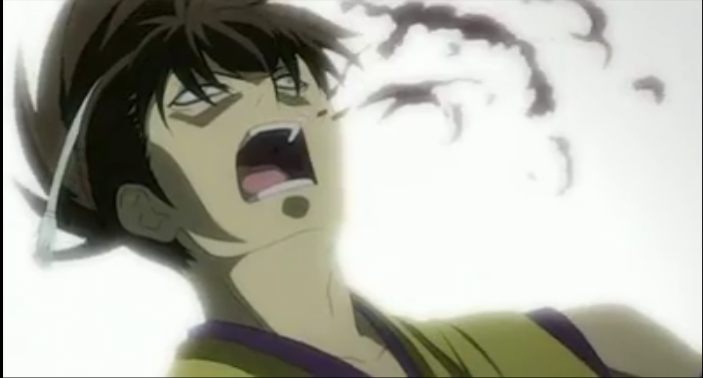 The Shinsengumi plan to act against Itou first, but this means killing Heisuke if he defends his new leader. Here, Itou-sensei, have some more wine. November 18, 1867, Kondou invites Itou for drinks. 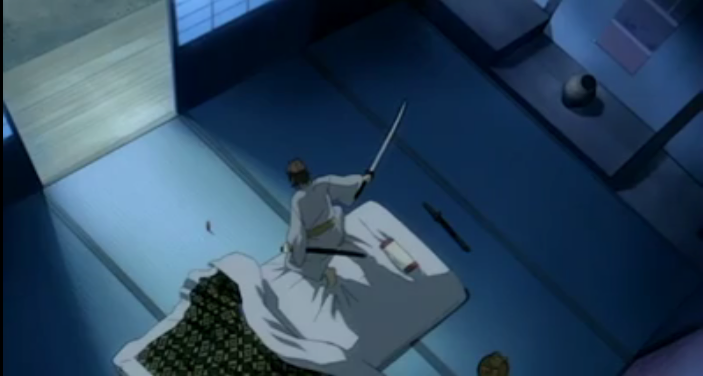 As he walks back to his headquarters, the Shinsengumi attack Itou and kill him. His body is brought to Aburano koji, and message is sent to Itou’s followers, the Guardians of the Emperor’s Tomb, while the Shinsengumi hide nearby, waiting to ambush those that come to recover the body. Chizuru wants to prevent the unnecessary death of a friend. Knowing that the Shinsengumi will be forced to kill Heisuke if he goes to Aburano koji, Saitou escorts Chizuru to a place where she can ask him to return to the Shinsengumi. Heisuke refuses to believe that Itou is a villain, and, hearing the call by his new comrades that Itou has been murdered, he rushes to the scene, followed by Chizuru. Unfortunately we haven't seen the last of these guys. When Heisuke arrives, he finds the bodies of Itou and others, but he also sees Sannosuke Harada and Shinpachi Nagakura fighting against a large number of samurai led by two of the oni. Once again the oni demand Chizuru be turned over to them. Believing that she can save the lives of her friends by doing so, Chizuru indicates she is willing to go with the oni, but the Shinsengumi won’t let her give herself up for their sake. 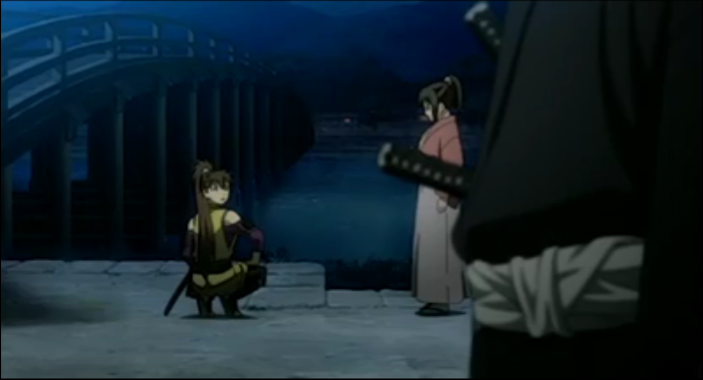 Provoked by Shinpachi’s taunting, Heisuke joins the Shinsengumi in the fight against the oni. Heisuke Toudou, may he rest in peace. The oni have beaten them in every previous encounter, retreating only because the fighting was proving inconvenient. It appears this time will be no different. 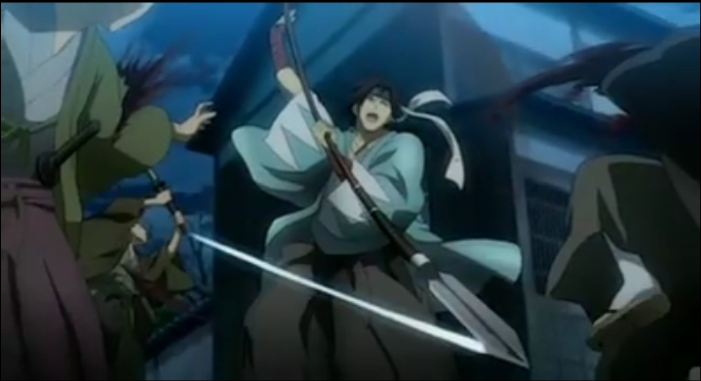 Heisuke is shown receiving what looks like a fatal blow from Amagiri. According to historical record Heisuke died at Aburano koji but at the hand of a new member of the Shinsengumi, who wasn’t familiar with the situation. Now we know the truth, it was a cover-up to conceal the presence of oni in Japanese politics. Meanwhile Souji Okita is in bed, suffering from his tuberculosis, when he is visited by Kaoru. 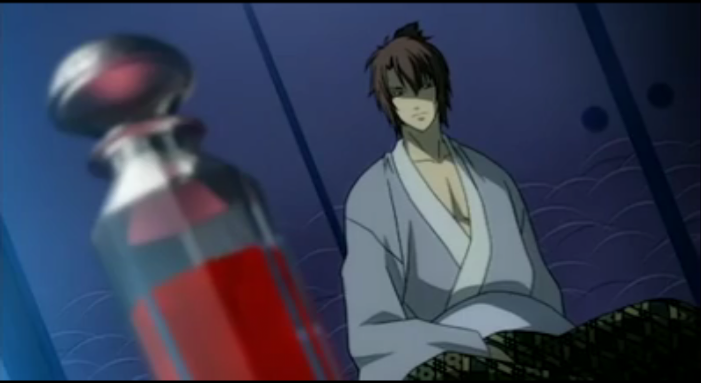 She gives him a vial of the ochimizu. She claims to be Chizuru’s sister, and that Chizuru told her about Okita’s illness. Okita doesn’t believe her story and neither do I. We just saw earlier in this episode that she denied knowledge of Okita’s illness. Further, if Kaoru really is Chizuru’s sister, why haven’t we seen them talking together? Clearly Kaoru is an oni, because she exhibits supernatural power in escaping from Okita’s attack, but that isn’t reason enough to trust her. Why does she want Okita to drink the potion? Is it really ochimizu? With only two episodes left, I wonder where the story will end. I had been anticipating some coverage of the Boshin War which begins about a month and a half from the events of this episode. Do they really have time remaining to get into something that big? It doesn’t seem so. Just dealing with the reality of Heisuke’s demise, and finishing up whatever is about to happen with Okita seems like it will occupy all the time remaining.